CHANTELLE PORRITT I play games. The characters are fantastic. Brilliant scripting, brilliant voice acting. If it were up to me, screw the Companion cube, I want Wheatley as my best friend. He starts off small, this little guy trying to help you out. Give you back your Aperture Science Handheld Portal Device (we’ll call it ASHPD for short), show you the ropes, guide you through GLADoS’ lethal test chambers. And then he EXPLODES. His character reaches new levels and he has this new side to him! Again, spoilers.. But the roles are all reversed! GLADoS is just as demeaning as ever. The amount of times she non-directly called me fat, I need more than two hands. You also see a very different side to her. I believe I received a compliment off of her at one point. I know right! Shocking!! Portal 2 is the type of game to make you feel like an absolute idiot and then five seconds later a GENIUS. I probably spent more time than I should have on some puzzles every now and again.. then something catches your eye and you’ve solved the damn thing. Could it really have been that obvious?! What was I even doing for all that time?! I’m going to bed. Then it’s like *aaahhhhhh* I can’t believe I did that! I am such a genius! Check me out, solving all these puzzles. Then BAM. Hardest puzzle in the world and you’re back to square one. But you don’t just have the ASHPD to solve puzzles now! Oh no, you’ve got propulsion gel, conversion gel, repulsion gel, spring-boards.. WALKING CUBES?! Thanks for that one, Wheatley. That made buttons easy. Oh, and the ending.. my GOSH. The achievement, “Lunacy” really sums it up; “Yes, that really did just happen”. INSANE. And then after the credits?! If you’re someone who doesn’t stay after the credits 1) Shame on you, and 2) Valve still bring the LOLs. They don’t disappoint. This is the type of game that makes you so, so happy that there are games like this out there. Valve truly are super stars. I totally aspire to be like them. They’re clever AND funny?! Eurgh, they make me want to hug them. TWICE. 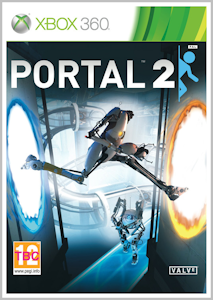 Portal 2 is a genuinely funny game, with many laugh out loud moments and hundreds of puzzles which you CAN solve, you just have to start thinking with portals. So seriously, go out and play it right now. You don’t need to sit down for hours and hours (unless like me, you can’t stop thinking about it even when you do put it down), it’s a pick up and play game with a fantastic and engaging story, and characters who have great chemistry with each other and yourself. P.S Did I mention it also has a co-op campaign?! The fun just doesn’t stop! Just be sure that when you play it, you choose a co-op partner who has some idea of how a Aperture Science Handheld Portal Device works and believes in physics. YOU KNOW WHO I’M TALKING TO.